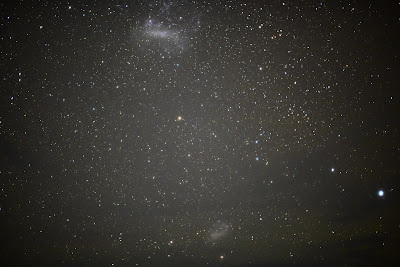 Here's a fascinating article about the 3 way tug of war going on between the Large and Small Magellanic Clouds (LMC, SMC) which can be seen in the Southern Hemisphere and our very own Milky Way Galaxy (MWG). This is a photo mosaic of an edge-on view of the Milky Way galaxy, looking toward the central bulge. Superimposed on it are radio-telescope images, colored pink, of the stretched, arc-shaped Magellanic Stream below the plane of the galaxy and the shredded, fragmented Leading Arm crossing the galaxy’s plane and extending above it. These gas clouds are being gravitationally pulled apart like taffy from the Small and Large Magellanic Clouds—satellite galaxies to our Milky Way—which appear as bright clumps within the gas. The source of the ribbon-like Magellanic Stream was uncovered by the Hubble Space Telescope about five years ago, and it was found to come from both Magellanic Clouds. However, the source of the Leading Arm remained a mystery until today. Now, scientists have used Hubble’s ultraviolet vision to chemically analyze the gas in the Leading Arm and determine its origin. Because they could not directly sample it, they instead used the light from seven quasars—the bright cores of active galaxies—to measure how it filtered through the Leading Arm’s gas. These quasars reside billions of light-years beyond the Leading Arm and act as “lighthouses” shining through the gas. Scientists looked for the absorption of the quasars’ ultraviolet light by oxygen in the cloud. This is a good indication of how many heavier elements reside in the Leading Arm’s gas. The team then compared Hubble’s measurements to hydrogen measurements made by the Robert C. Byrd Green Bank Telescope in Green Bank, West Virginia, as well as several other radio telescopes. Marked locations indicate the three brightest of the seven quasars used to study the composition of the Leading Arm. Spectra for these three quasars are superimposed at the bottom of the graphic. The vertical axis of each spectrum indicates how much absorption is taking place. The more absorption, the greater the signal strength is. The horizontal axes indicate the velocities of the gas at different points. Blue boxes isolate the velocities unique to the Leading Arm. The oxygen, combined with the hydrogen, provided conclusive chemical “fingerprints” to match the origin of the Leading Arm’s gas. 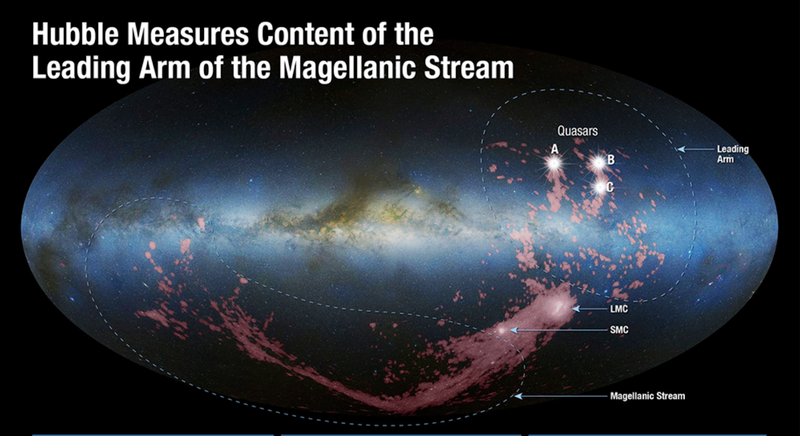 The team found that the gas matches the contents of the Small Magellanic Cloud. It is amazing to think that gas from the SMC will possibly provide the MWG the raw material needed to form new stars and solar systems far into the future.